It isn't often that people venture over to the Upper East Side, and that's a shame. This area is filled with plenty of upscale shopping locales and a vibrant arts scene. More importantly, it's one of the booziest neighborhoods on the island. All Manhattan apartments have one thing in common, they're close enough to catch a train to one of the greatest cocktails your lips have ever kissed. Here's a list of locations where you can enjoy a divine creation from the hands of a mixology master. This pub is known for one thing and one thing only, the best place to get your whiskey fix. From classic standbys to rare, barrel aged delicacies, you can find more than what you're looking for on their shelves. While you may want to drink the majority of their incredible selection straight, don't be afraid to let the barkeep fix your favorite up into something wonderful. Surely you've heard the name before, it's synonymous with delectable dining and, you guessed it, cocktails. Hop over before happy hour ends to try a wide variety of the best mixed drinks in town. They have everything from a true Old Fashioned to a what just might be the best recipe for Bloody Mary in existence. The atmosphere is semi-upscale elegance, so your work suit will do just fine. Speaking of elegance, JBird is the place to go if you are a true cocktail enthusiast. Try out the Blackheart Machine, named by Rust Cohle, which features aged rum blended with coffee and Fernet Branca. Better yet, bring a friend and try out one of their two person cocktails. The Tiki Oasis Punch, an elaborate mix of what lightweights would call too much rum, is an excellent choice. JG Melon breathes the air and shares the pule of New York City. When it comes to classic bars, this is it. While most might be tempted to head straight for a burger and beer, you know better. Order yourself a mixed drink and relax on one of their futons like a real New Yorker. Whatever British pub you like to frequent pails in comparison to Jones Woods. The makers of their to-die-for self names IPA aren't afraid to step away from the beer tap and whip you up a Raspberry and Lavender Gin Fizz, Pimm's Cup, or Bramble. Plus, you can dine on bar friendly eats like their lamb and rosemary pie. This is the cocktail side of the ABV-Earl's-Guthrie family. With classics like Sazeracs and Sidecars supported by an all-star original cast, there's no end to after work suaré. If you're feeling overwhelmed on your first few visits, which you probably will, try a Sharpie Mustache. It features rye, gin, and Meletti tiki bitters. This one is fairly new to the Upper East Side area, but most certainly worth a visit. Their menu features a wide variety of Negroni options from barrel-aged to bottled that pair amazingly with their fresh oysters or mac and cheese with Irish cheddar and Asiago. An indulgence of flavors is the best way to describe a night out at The Gilroy. When it comes to putting more hair than you already have on your chest, bourbon is a sure fire way to do so. Bondourants is well known for craft beer and southern foods, but their list of bourbons is incredible. Take them straight, mix them up, do whatever you like but make sure to try their Boudin meatballs. Many people avoid Dorrian's for it's air of show off-y elegance and older crowd who turn up their noses at the semi-formal. Don't let that stop you from going in, though. Why? If there's one thing this kind of pompous, old time location can do it's make a classic cocktail. It isn't easy to find a real Old Fashioned these days, unless you hop into Dorrian's. Then it's pretty easy. If you crave sophistication but prefer a more pleasant atmosphere, give Bemelmans a try. 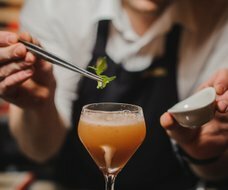 Their cocktail program is refined and as fancy as they come, which means you'll be able to try out something new regularly. Don't worry if your wardrobe doesn't have something that matches the occasion. You won't care three drinks in. After trying out this spectacular bar scene (this article didn't even include the craft beer havens and all-wine bars), you might find yourself wanting to move to the Upper East Side once your current lease is up. Keep things as classy as the last cocktail you had and check out Renoir House. It's the quintessential New York City experience with modern touches and top rated amenities you won't find anywhere else. From iced white quartz countertops to private terraces and under cabinet lighting, every detail of these newly redesigned apartments have everything a home in the city should.